The play park at Elm Park is set to get a £70,000 overhaul after money was released to pay for the rebuild. A consultation will now be held in Filton in January for families to give their views. The playpark, which has seen calls for a revamp over the years, will now be subject to a consultation with families to decide the new layout. The money was paid to South Glos Council by developers as a condition of house building in the local area. It was agreed at a recent meeting of the Southern Brooks Area Forum. Filton Town Council has also agreed to put up £10,000 on top of the £60,000 developer money. The town council money is ‘106 money’ left in the coffers from the development of the Combination Ground, Gloucester Road North. It is understood the popular and modern playpark at Canford Park cost around £50,000 so councillors are optimistic Filton will get something special. 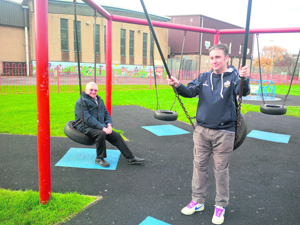 In a joint statement, Cllrs Adam Monk and Roger Hutchinson, pictured, said: "We are extremely pleased to have secured funding through new homes bonus for improvements to the play area in Elm Park which we think everyone would agree are in need of updating. "In the current climate of austerity cuts it is really refreshing to have something positive to talk about." A town council spokesperson said: "Filton Town Council has been successful in receiving grant funding for a new play area at Elm Park. "We are in the process of planning a consultation session in the Pavilion on 18th January 2014, 11.30am–12.30a.m to gauge the views of local children and parents." The area forum also agreed £10,000 for the Pyramid Youth Club and £33,000 for repairs in 10th Avenue.